Park Tae-hwan became the first Korean to win a gold medal at the FINA World Short Course Swimming Championships in Windsor, Canada on Tuesday. In the men's 400-m freestyle, in a 25 m-long pool, half the length of the regular pools at the Olympics and other international competitions, Park clocked 3:34.59, 0.71 second ahead of runner-up Aleksandr Krasnykh of Russia. Park took part in this competition with a fresh mind to start all over again, and it was his first time to compete in the event in almost 11 years. 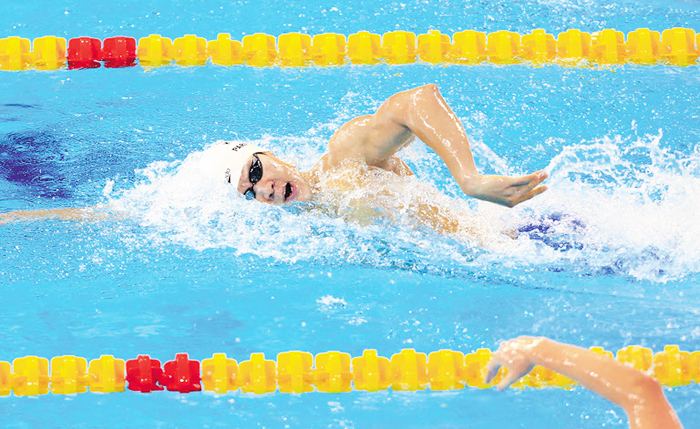 At the age of 17, Park won silver in the men's 400-m freestyle and 1,500-m freestyle in Shanghai, China in 2006. "Park has determination to improve his record in as many competitions as possible, however small they might be," a staffer for Park said. Swimmers usually get a better time in the short 25 m-long course because they gain momentum when they turn every 25 m. Park's time on Tuesday was about seven seconds faster than his personal best in a 50-m pool, which is 3:41.53. Most of world's top swimmers of this distance such as Mack Horton of Australia and Sun Yang of China, who won gold and silver respectively in this year's Olympics in Rio, did not compete on Tuesday. But it shows Park is quickly regaining his form as he competes.